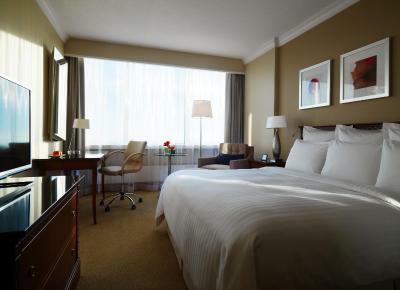 Lock in a great price for Warsaw Marriott Hotel – rated 8.8 by recent guests! Great location, superb view, huge room, really nothing to complain about. The location is very good, everything needed is around within walking distance. The breakfast was very nice. location is central, staff is very friendly. Cleanness was remarkable. The breakfast was great, and the bed was very comfortable. The room was a little small, but worked fine for my purpose. 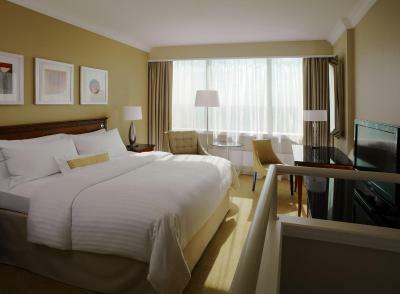 Warsaw Marriott Hotel This rating is a reflection of how the property compares to the industry standard when it comes to price, facilities and services available. It's based on a self-evaluation by the property. Use this rating to help choose your stay! One of our top picks in Warsaw.The luxurious Warsaw Marriott Hotel is located in the very center of the city and features rooms with a mini-bar, satellite TV and air conditioning. 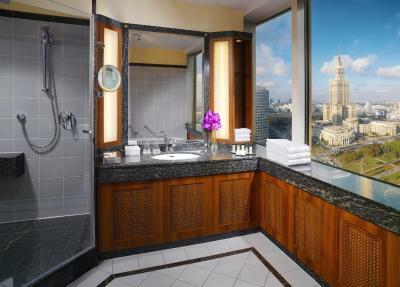 The rooms offer panoramic views of Warsaw. 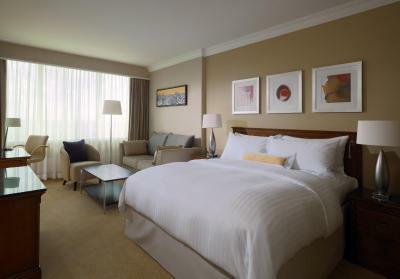 All rooms at the Marriott are fitted with an LCD TV and a comfortable seating area. Guests can benefit from a safety deposit box and a small refrigerator. Warsaw Marriott Hotel has several bars and restaurants, including Parmizzano’s, a popular Italian restaurant and a sports bar, Champions. In the morning a varied buffet breakfast is served. During their stay at the Marriott Hotel, guests can relax in the hotel’s sauna, fitness center, massage parlor and swimming pool. There is also a casino. The Marriott is located just 1,300 feet from the Złote Tarasy Shopping Center. Warszawa Centralna Train Station is just opposite. 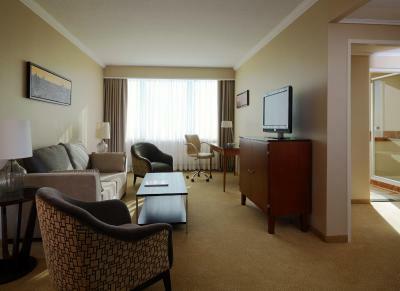 When would you like to stay at Warsaw Marriott Hotel? 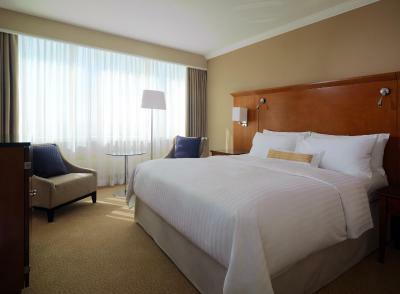 This spacious, classic room offers a view of central Warsaw and features 1 king size or 2 single beds. Public parking is available on site (reservation is not needed) and costs PLN 12 per hour. Public parking is available on site (reservation is not needed) and costs PLN 220 per day. Located at the 37th to 39th floor - the most prestigious and boasting the best view. 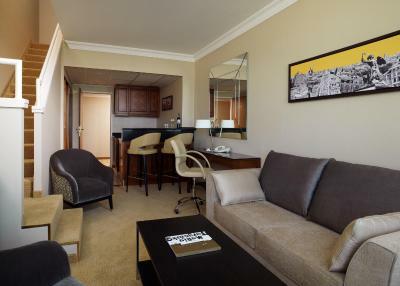 This extra spacious suite features a bathroom with large windows and great views of the city center. Offering panoramic views of Warsaw, this 40 square yard Bi-Level Suite has two floors, a fully equipped kitchen, a dedicated work desk area with high-speed Internet access and a bedroom. This apartment has a living room and a sleeping area, as well as a dedicated work desk area and high-speed Internet access. 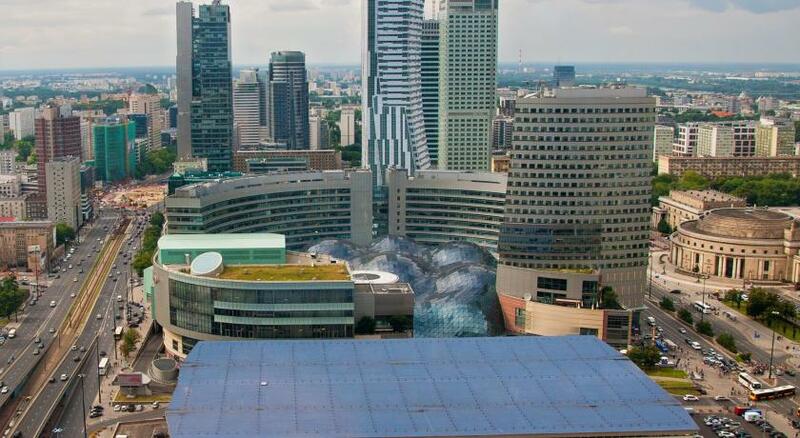 The room offers a panoramic view of Warsaw and access to the M Club Lounge with a view of the city center. 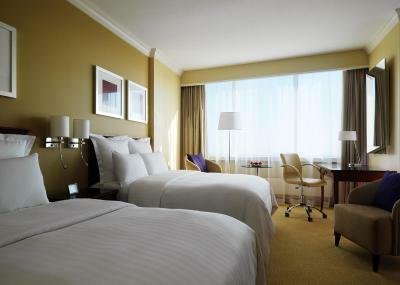 The Warsaw Marriott Hotel is a prominent hotel and one of the most exceptional hotels in Warsaw. Located in the heart of Poland's capital, Warsaw Marriott Hotel offers easy access to all major attractions and elegant, comfortable interiors. WiFi is available in the hotel rooms and costs PLN 39 per 24 hours. 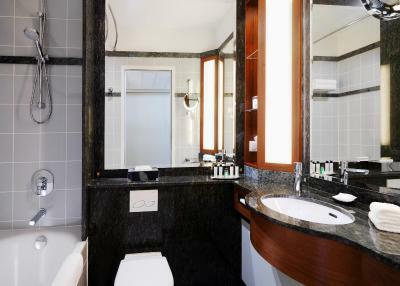 House Rules Warsaw Marriott Hotel takes special requests – add in the next step! All children under 16 years are charged PLN 118.80 per night for extra beds. Any additional older children or adults are charged PLN 118.80 per night for extra beds. Warsaw Marriott Hotel accepts these cards and reserves the right to temporarily hold an amount prior to arrival. The credit card used to make the nonrefundable reservation must be presented at check-in. If the credit card is not available, please contact the hotel prior to the arrival. Please note that in the case of children staying in the room using existing beds the breakfast is not included in the price. Please note that there is a refundable deposit. You have to pay for interner- seriously ??? Pool very small one jacuzi didnt work. Its in the heart of warsaw. Great food! I had a problem with noisy neighbours, i had to get up very early. I asked another room, which I also got without any problem. Personell was extremely friendly. It was still noisy during the night and woke up several times. I had to pay parking. Super friendly stuff, great food, fantastic location.